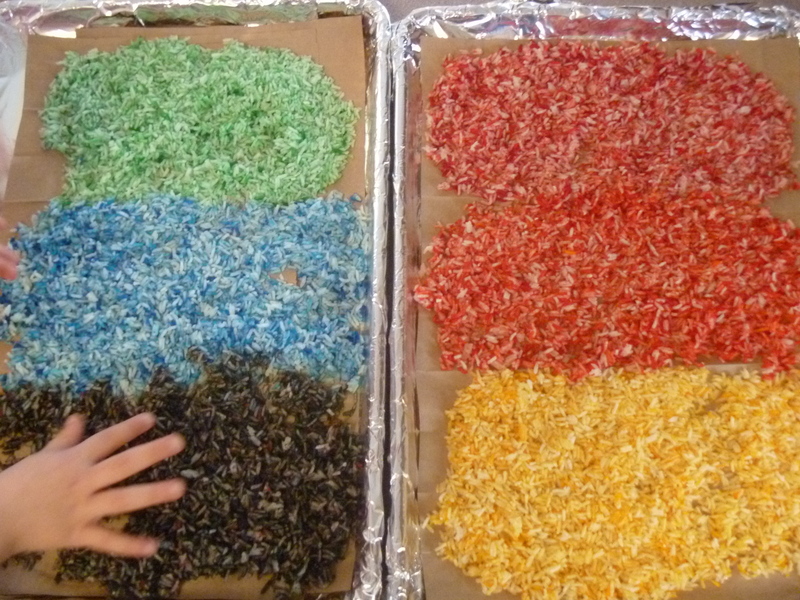 In the spirit of St. Patrick’s day (or as my kids call it ‘Leaf Day’) we made Rainbow Rice boxes with little gold gems. We already made the traditional paper crafts with painted hand prints and shamrocks. So, I wanted something a little different and interactive. All I used to make the colored rice. I was expecting a much bigger mess than we made, hence the double layering of foil and paper on the baking sheet. I did not have parchment paper on hand, so I just cut open a couple of brown paper lunch sacks. 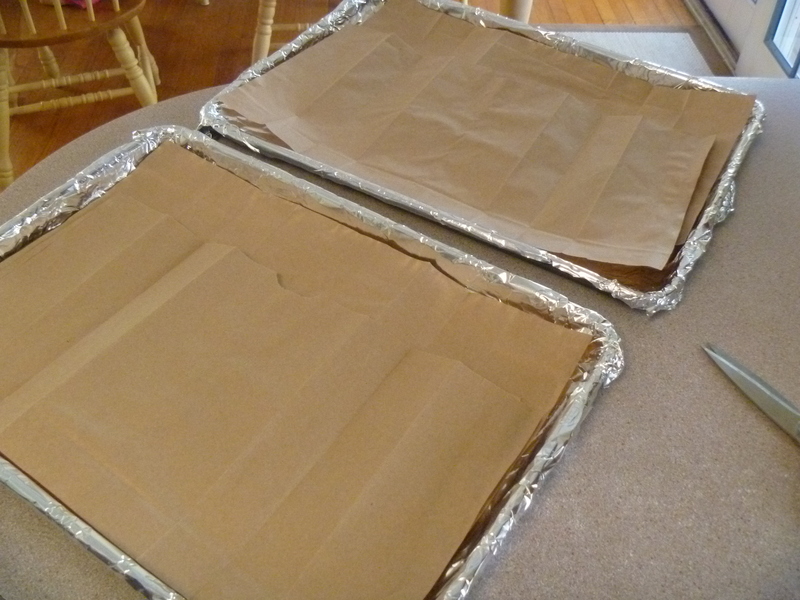 Baking sheets lined with aluminum foil and brown paper. 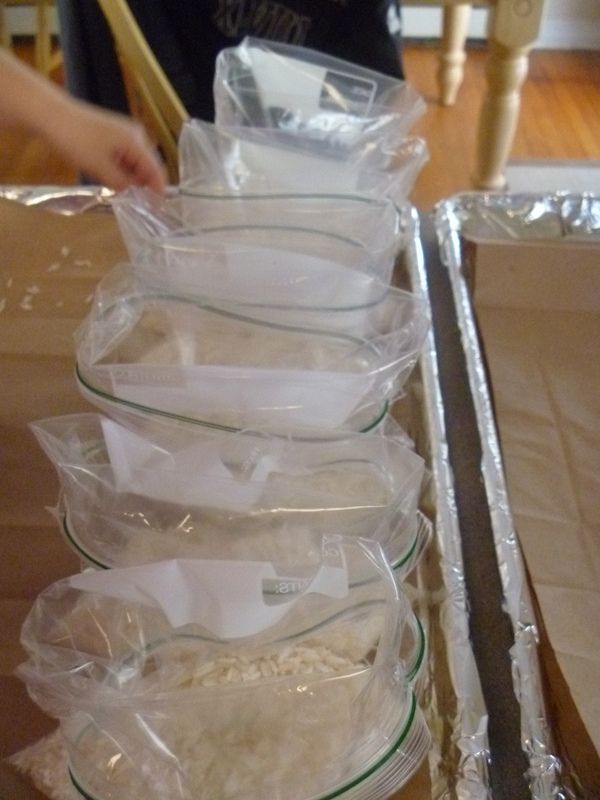 I filled 6 plastic zipper bags with 1 cup of rice. I used 1 tsp. of vinegar and several drops of food coloring. I did not measure the drops of food coloring, but used a small amount to start and added more if I wanted more vibrant colors. 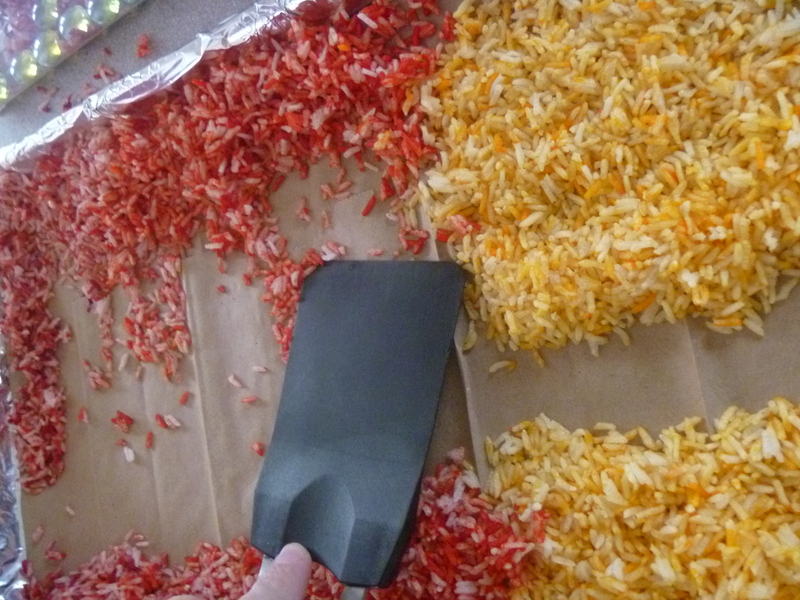 The kids helped me spread each colored rice onto the paper. 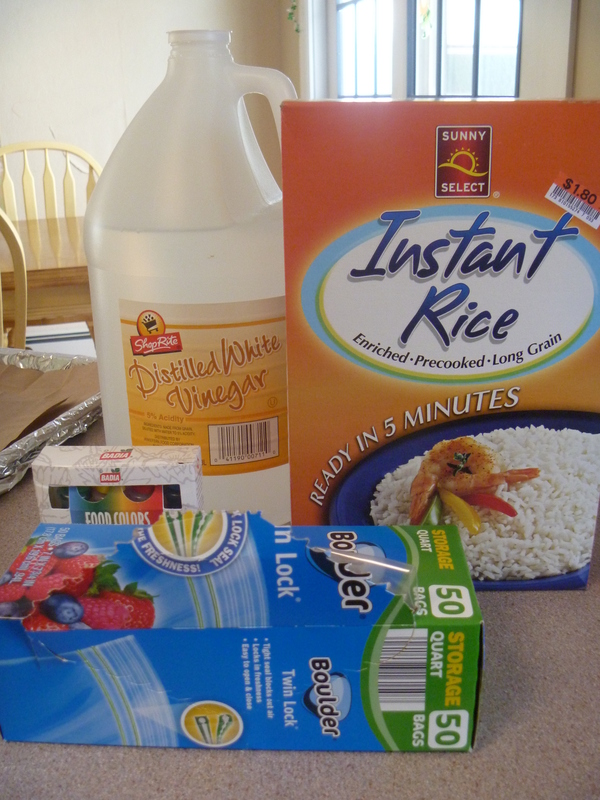 I expected by adding vinegar and liquid colors the rice would be more wet. But, it just needed an hour to air dry. Be sure to spread it nice and thin one color at a time. 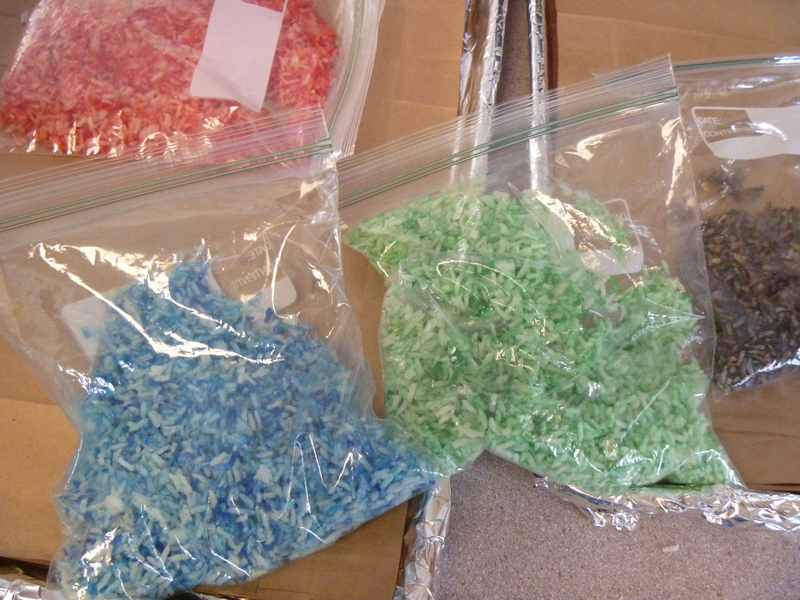 While the rice dried we added our gold pieces (gems) to the bins. 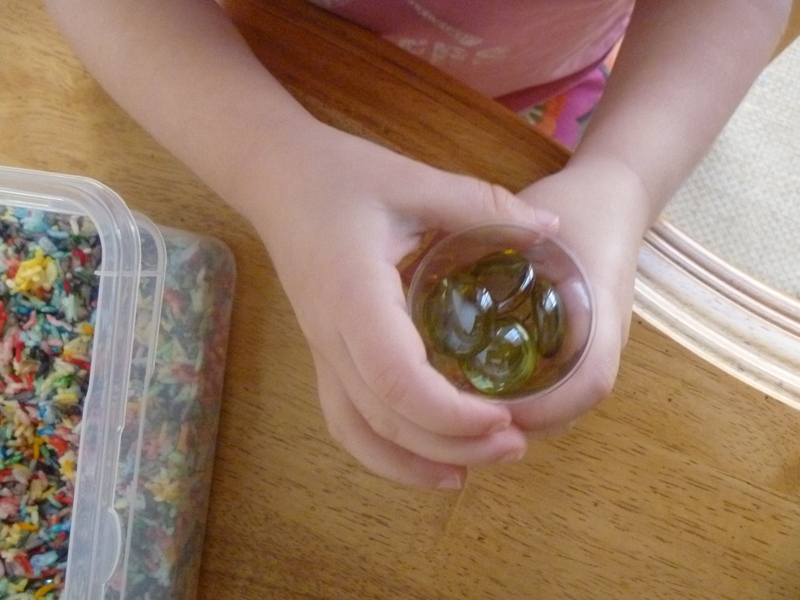 We talked about St. Patrick’s Day, Ireland, Leprechauns, rainbows, and pots of gold while we cleaned and dried the gems. I was amazed by my kid’s questions. Our conversation felt like it was a lesson without being a formal lesson. While we waited for the rice and gems to dry completely we hung our St. Patty’s decorations around the house. Gold gems serve as our gold pieces. 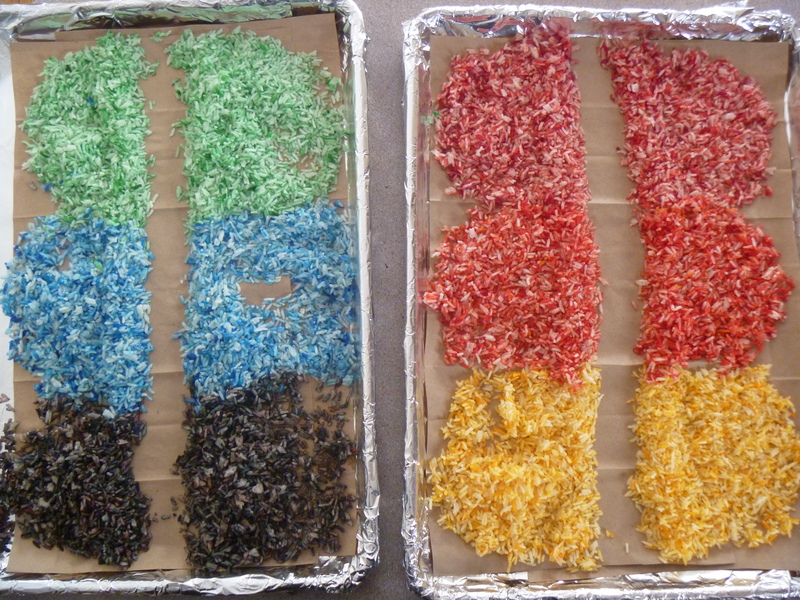 Once the rice was dry I separated it into two columns to divide between two bins (clear plastic shoe boxes). The kids chose to use a spatula to scoop and dump the rice into their bin. 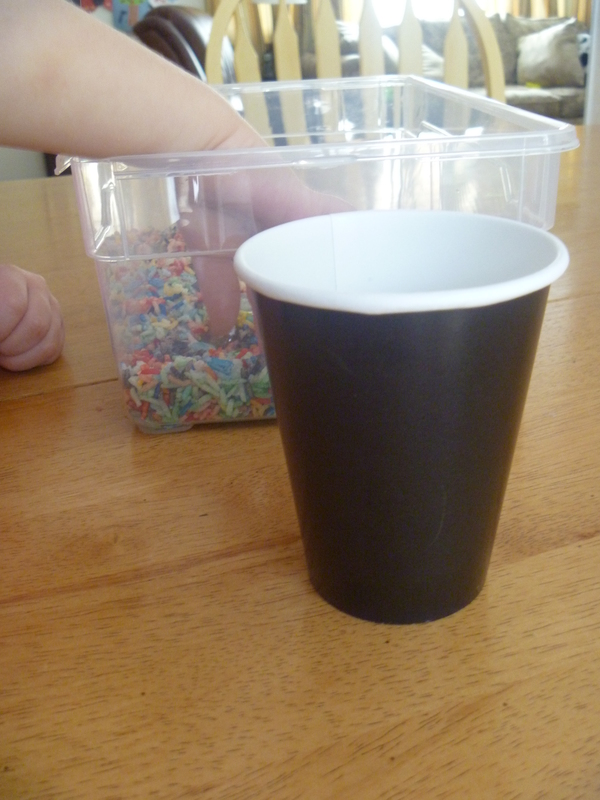 I remembered I had left over black paper cups! Thought it made a great “pot” for our gold. Black paper cups become our pot of gold. I added small plastic shot glasses as little scoops for the rice. Smaller scoop cups to sort our gold. 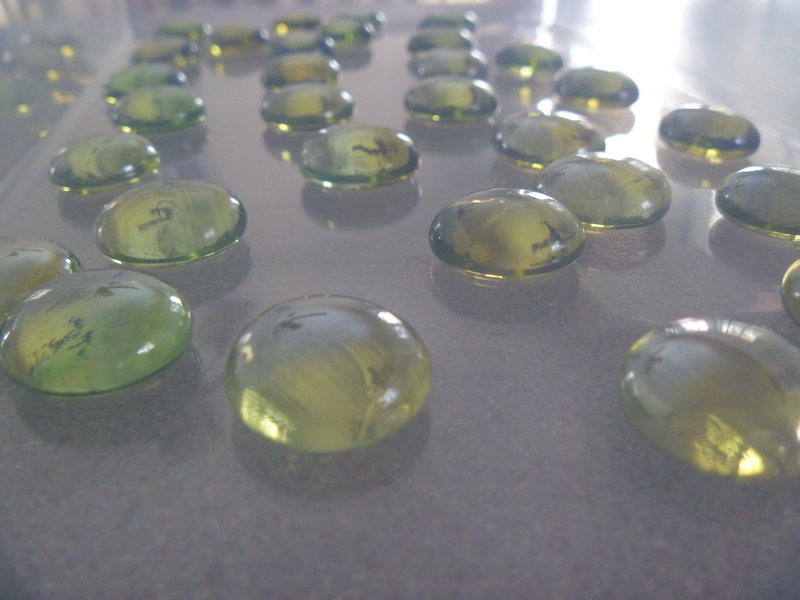 The whole project took around an hour and a half- including drying time. My husband noted the rainbow rice looked pretty similar to Fruity Pebbles. If you really want to you can dump cereal in a box and throw in some gold gems and be done. But, we really enjoyed the entire experience! « Painting away the winter blues. We died tube noodles for Monkey to string on yarn as our garland for the Christmas tree a few years ago. It was really fun. I bet he would love this idea too. I agree with the hubs, the rice does look like fruity pebbles. An edible version is great for little ones who still put things in their mouth! And, it’s just plain fun!